Premise: A team of three contestants plays a series of four rounds with a starting prize fund of £20,000. Before each round, the team will be shown ten keywords pertaining to the questions in the round and will have 20 seconds to briefly discuss the keywords. In each of the three rounds, one teammate faces 10 multiple-choice questions and the total prize fund is divided into 10 golden columns. 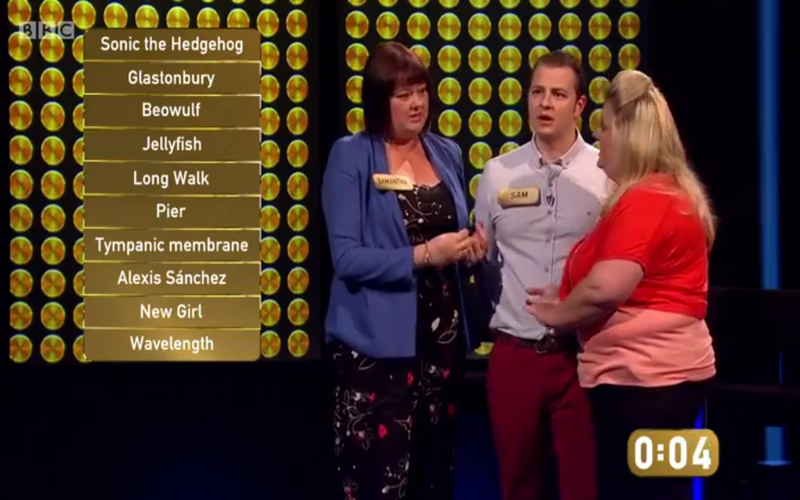 A correct answers lights up a column on the “Golden Wall” and an incorrect answer “decimates” a column and 10% is deducted from the team’s prize fund. The team will be provided with five “Pass Back” and five “Overrule” helps during the main game. A Pass Back enables the teammate to pass the question back to their two teammates and allow them to answer. The Overrule allows one of the teammates to give a different answer if they don’t agree with the initial response. In the final round, the team’s prize fund is divided into 10 columns once more and the team has two minutes to answer at least one question correct in each of the 10 categories. Only one teammate is allowed to played at a time and if a teammate fails to answer a question correctly in three attempts in a category, a column is decimated, the clock stops and a new teammate takes over the round with a redistributed prize fund wall. If time expires or if all three teammates fail to answer one question correctly in a category in three attempts, the round ends and the team leaves with nothing. If a teammate can answer one question correctly in each of the 10 categories, the team wins their remaining prize fund. 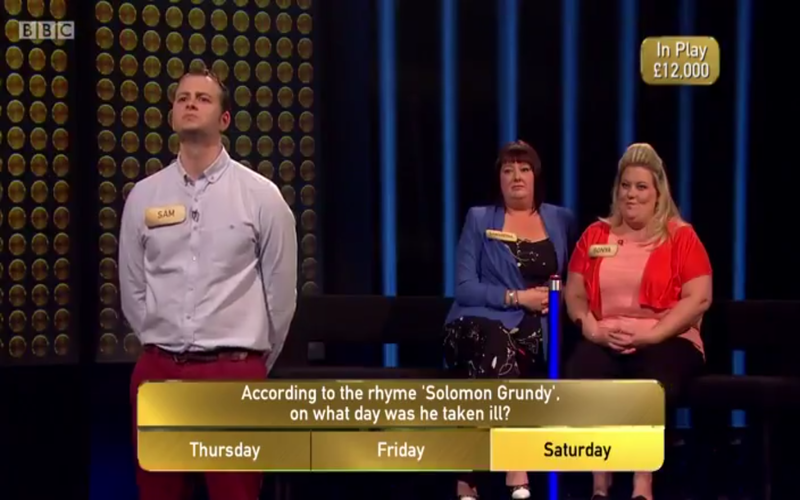 Like The Edge and The Quizeum, Decimate is another solid quiz show to add to BBC’s daytime lineup. 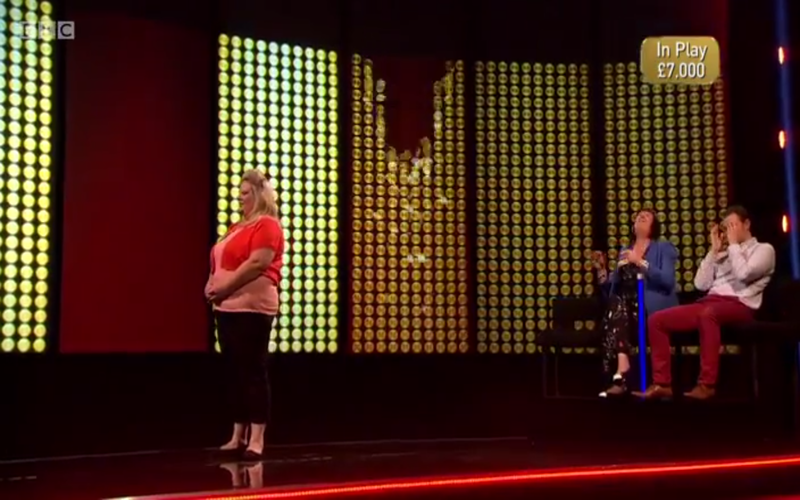 Decimate has the similar intriguing gameplay as 1000 Heartbeats, The Exit List and The Million Pound Drop where it feels like the contestants are traversing through a trivia adventure. It’s even more fun to watch the interesting and sometimes humorous dynamic of trios of family members go head-to-head against the game as you might have seen nearly all week. There are several reasons to check this show out whether you’re in U.K. or in the U.S., from the gameplay elements to the show’s host Shane Richtie. The show’s gameplay flows well at a steady pace through the main game and appropriately intensifies toward the end of the show in the two-minute end game. Much like The Chase, Decimate has a healthy range of question difficulty levels, with the exception of this series arranging the questions from easy to difficult in the first three rounds, and is simple, yet captivating enough to gage your interest for the entire hour. The in-game music adds a little more drama to the show including the deep-voiced “DECIMATE” incorrect answer cue that chips away at your soul with every column destroyed. Another gameplay element that makes this show curiously interesting is how the Overrule and Pass Back helps are designed for their potential success to the contestant to be solely contingent upon the teammates’ knowledge and confidence, unlike other shows where the contestants’ use of certain lifelines are aided by outside help from game (e.g. : Millionaire’s 50:50/Jump The Question/Switch The Question lifelines = the game eliminating two of four possible answers/skipping a question level/swapping out a question). 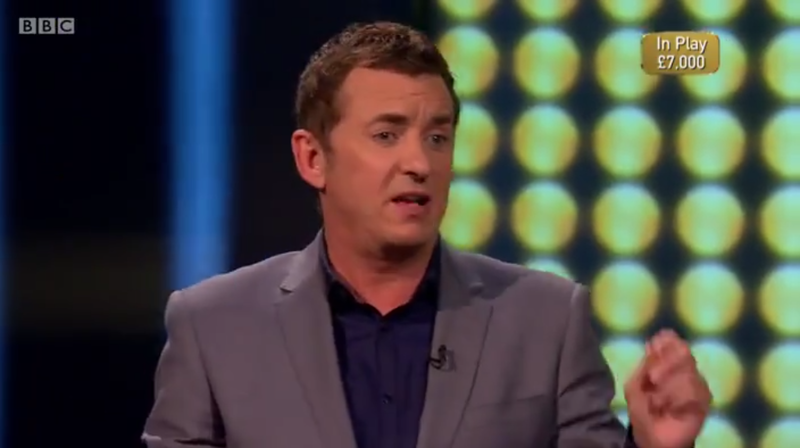 Moving on to the host, Shane Richie is doing a wonderful job as the show’s emcee. If I were to compare his excellent hosting abilities to anyone one, it would be to Bradley Walsh. Like Walsh, Richie takes his time to get to know the contestants well and he really gets into the game by showing zeal and excitement upon each correct answer and even exhibits genuine anguish whenever an incorrect answer is given. Overall, Decimate is a great quiz show with excellent focus on team dynamics as the key to earning a massive cash payout and the type of show where the team’s roller-coaster journey through the game keeps you tuned in. Believe it or not, I had very little complaints about this quiz show. The only minor issue I had with this show were the 20-second briefings I felt the show could have gone without — that is, until I had seen how helpful those briefings could be during the course of a game when a lot of substantial information is reviewed within the 20 seconds. I believe BBC will pickup a second series of Decimate within the next few months. U.K. viewers, watch new episodes of Decimate weekdays at 3:00pm BST on BBC! This is probably another addition to the small number of BBC game shows that will be exported around the world and I think it will do well here in America. Why does Richie yell when answers are correct? Talk about OTT….